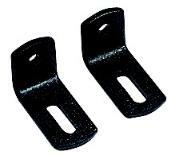 SHO-ME 11.4474 WINDSHIELD BRACKETS per pair. Use with SHO-ME: 11.2000 LED Interweave Light, 11.2005 LED Light, 11.2710 Double Light Stick, 11.2715 Triple Light Stick, 11.2720 Quad Light Stick, 11.2725 Quint Light Stick, 11.2840 Duo Dash Light, 11.3705 LED Light Kit, 11.8000 LED Dash Light, 11.8200 By The Inch Lights, 11.8600 Slim Light, 11.9000 Micro Lights, 12.5003 Hyper-Brite Trio Light, 12.5006D Dual Hyper-Brite Light, 12.5020D Hyper-Brite Light Kit, 12.5023 Interweave Hyper-Brite Light. Click on image to enlarge.